There is a beautiful Chinese saying that is often used by a man to compliment the beauty of his girlfriend: “You are the April of this world”. In this beautiful season when the grass is sprouting and the orioles are flying, the mobile industry is also beginning to embrace its April day. As a wave of new smartphones powered by the latest generation of Qualcomm processors hitting the market, Antutu performance ranking list for Android phones has had earth-shaking changes. 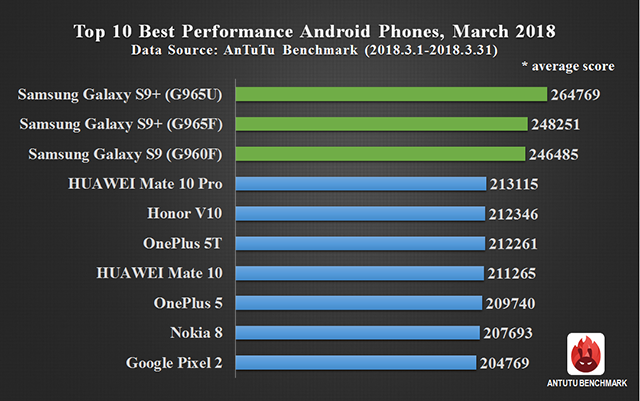 Today Antutu reveals our benchmark results for the global 10 best performance smartphones of March. Is your phone on the list? Come and check with us. 2.Period of data statistics: March 1, 2018 to March 31, 2018. 4.Data source: Antutu Benchmark V7. Samsung Galaxy S9 series, the latest flagship phones of Samsung, managed to refresh the record score of our Top 10 performance Android list with three models of Galaxy S9+/ Galaxy S9 series occupying the top three positions of our March ranking. Galaxy S9 (G960F) which is also powered by Exynos 9810 processor ranked third with an average Antutu score of 24648 points. Making up the rest of this month's Top 10 are HUAWEI Mate 10 Pro (No.4), Honor V10((No.5), OnePlus 5T (No.6), HUAWEI Mate 10 (No.7), OnePlus 5 (No.8), Nokia 8 (No.9), and Google Pixel 2 ((No.10), all of which has also appeared on the top ten list of February except Google Pixel 2 which replaced the seventh-ranked Mi MIX 2 and entered the Top 10 of March ranking. In general, we can see that Qualcomm Snapdragon 845 mobile platform dominated Antutu March ranking with absolute advantages. Meanwhile, with Kirin 970 processor, the flagship smartphones of Huawei also entered the top ten. It should also be noted that Snapdragon 835-powered smartphones can still achieve an average Antutu score of over 200k and are still good choices for those who don’t have high expectations for mobile processors. The above data reflects smartphone performance for March 2018. For more information about the ranking list, please visit Antutu official website or download AnTuTu Benchmark and check in the menu of “Ranking”.